Awww thanks. It sure does photograph all pretty once we make the beds and pick up all the dog toys. I’m sure your house is gorgeous even with unmade beds! Can’t wait to see what you have planned for that infamous bathroom, It has stiff competition from the rest of your incredible abode. Just you wait Janet!!! We have some ideas….. I don’t care what you call it, I love it. I love your use of color and scale. Plus the subject matter is my favorite. I really liked your Christmas decorations. Aww thanks Ann, No fear of color in this house. If I told you red was my absolutely least favorite color would you believe it? It is…..But it sure makes the place cozy. How awesome is that, you two must be very flattered!!! Awww geezzz, so glad that we can inspire. I Love your home. When I start to move things around mine I always peep at yours for inspiration! Thanks Shel, you can never have too many things, surround yourself with the things that make you happy….and , sadly, no, I didn’t get that record player for Christmas. But I want one…reall bad like. 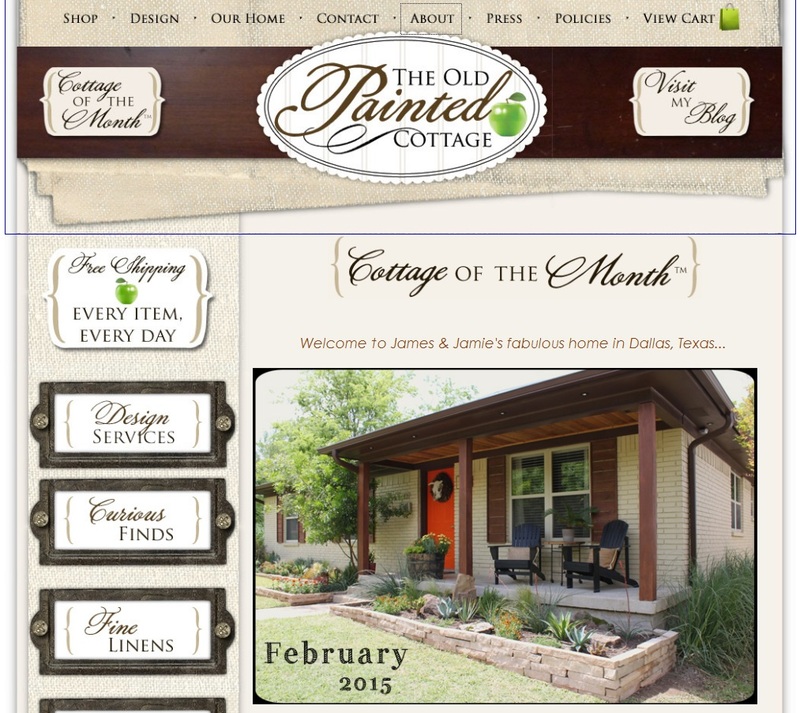 I checked out cottage of the month when the calendar turns and what a treat to find your home! Love all the color and texture. You really have a beautiful home! I don’t live too far from you in the Lake Highlands area of Dallas. Aww thanks Lucinda. Our home is just a reflection of us…and everything that means something to us. Wow, guys…just wow! Keep up the great work….! Thanks Erik, We plan to keep on keeping on…. Thanks Tonja, so glad you found us…..we’re excited to start on that bathroom too. Best house tour ever on Cottage of the Month! I love your style. Your home is so warm and inviting and your garage is fantastic too. I’m going to start following your blog so I can see the bathroom progress. You rock! Aww thanks Patti, we are pretty curious to see just how the bathroom remodel is going to go as well…Stay tuned.